Working together was always a part of Jack and Maureen Gimblett’s 62 years of marriage and it was through this lifetime partnership they received a unique award, high honours from both the Anglican and Catholic churches. Married in 1950 when “mixed” marriages were a no-no: Jack worshipped at All Saints Parish and Maureen at St Mary’s, at the other end of Te Rauparaha Street, but through 60 years they helped at each other’s churches. Jack was “Mr Fixit” attending to the gardens and general maintenance at All Saints, helped Maureen down at St Mary’s and for many years was caretaker and pool custodian at St Peter Chanel School. Maureen and Jack looked after Hadfield Hall, while still assisting with many tasks at St Mary’s, cooking at the Presbytery and singing in the choir. Both taught at Sunday School and served on their respective churches council and vestry. 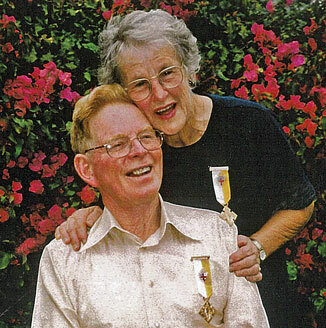 In 1997 this long partnership was acknowledged by the Anglican parish with both Anglican Jack and Catholic Maureen receiving one of the church’s highest awards – the Bishop’s Medal. At this time they celebrated their 50th wedding anniversary. In 2000, they were presented with the Benemerenti Medal – the Pope’s medal, the family also granted the Papal Blessing, recognising their good works within the parish and Otaki. The two medals are still probably unique world-wide, two denominations awarding both members of a “mixed marriage”. The partnership ended with Maureen’s death in November 2012. Jack’s life ended this month. He was farewelled at All Saints on October 17. “They were always very involved (at both churches) all our lives and they kept us involved, too.” daughter, Joanne Russell said earlier. When he wasn’t working around the churches or school, he was often down at the Otaki Children’s Health Camp, playing board games with the children in the evenings, or accompanying children on the bus journey to New Plymouth, going laden with food and activities for the trip. The Gimblett family came to Otaki in 1939. After a year at Wellington College, he went to Levin as a foundation pupil of the new Horowhenua College. Jack helped his father in the grocery store and with deliveries. He began working with the Otaki Post Office after leaving school. He met Maureen in 1943 at a dance in the old Anglican hall, but it was another seven years before he walked her down the aisle. After a year away they returned to Otaki in 1951.They had four children, one son and three daughters. Jack returned to working in Gimblett’s grocery store, on the east corner of Main and Matene Streets. The family home adjoined the shop where the Town and Country take-away is now. This was one of the original shops in Main Street. Later his father bought the Bills and Moore hardware shop across the road and moved the groceries over there and put the hardware over in the old shop, which was then operated by his brother Ted. Jack later took over the grocery and which later became Four Square.